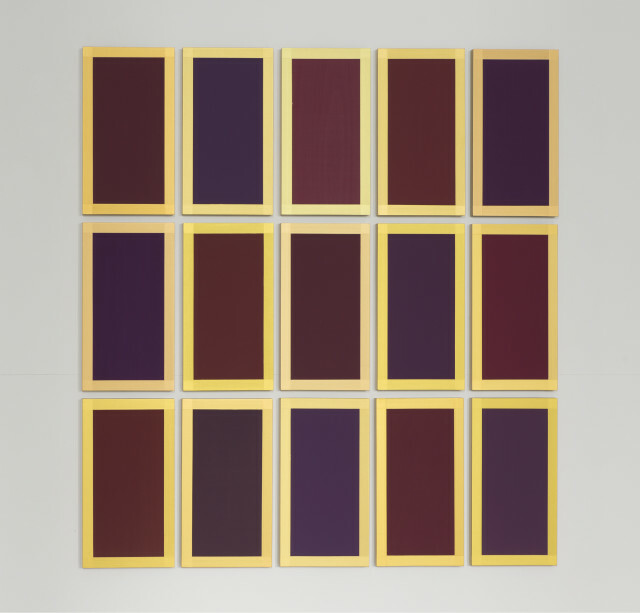 At first glance Roeth’s painted panels of wood or slate appear very simple: flat planes of colour that look a certain way, but which shift in the changing light or as you move around them. They are exquisitely painted in layers of tempera and velvety pigment and reveal their secrets slowly: quiet combinations that play gentle tricks on the eye - simultaneously drawing the viewer into dense voids and bouncing the gaze back with a vibrant intensity. Roeth’s compositions are distilled to this apparent simplicity through the most minimal ingredients. Sometimes a picture is divided into grids, a geometric harmony of lines and colours, so that the matt expanse of paint is broken up by shimmeringly luminous lines in a perfect balance of light, depth and colour. Others combine planes of a single colour with a contradictory border: an edge on which the picture turns. In a world so accustomed to instant gratification Winston Roeth’s paintings require and reward an unusual level of contemplation. Roeth, who is based in Beacon, New York State, has been described as “…probably the best color painter in New York” by American critic Michael Brennan. He has exhibited extensively and his work is in many important collections, including the Kunstmuseum Basel; the Fogg Art Museum (Harvard); the San Jose Museum of Contemporary Art and the celebrated Panza Collection where his paintings form a site-specific installation in one of the gilded and panelled rooms of the C17th Palazzo Ducale di Sassuolo in Varese, Italy. Winston Roeth had a solo show at Ingleby Gallery in Spring 2011. Recent solo exhibitions include Winston Roeth: Recent Work, XF Xavier Fiol, Palma De Mallorca, Spain and Jensen Gallery, Syndey, Australia.